Founded in 1540, the city has a line to the usage of the old Spanish cities, with square blocks, as an immense chessboard. 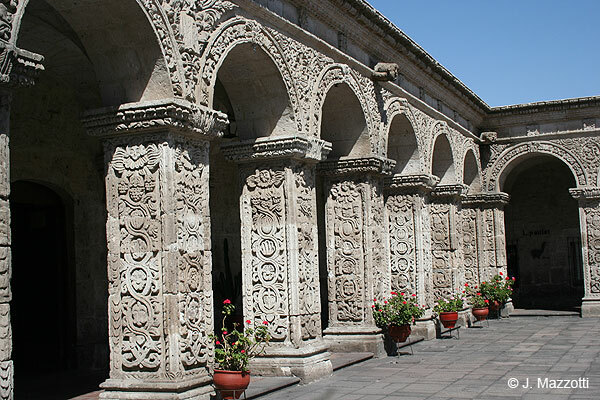 The historic centre of Arequipa, built in volcanic sillar rock (ashlar), represents an integration of European and native building techniques and characteristics, expressed in the admirable work of colonial masters and Criollo and Indian masons. This combination of influences is illustrated by the city's robust walls, archways and vaults, courtyards and open spaces, and the intricate Baroque decoration of its facades. 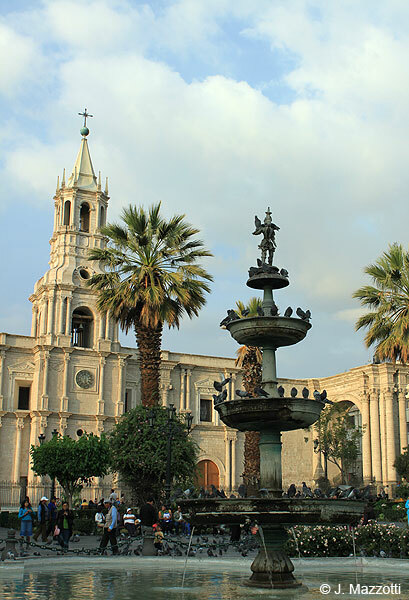 The Historical Centre of Arequipa is an outstanding example of a colonial settlement, challenged by natural conditions, indigenous influences, the process of conquest and evangelization, and the spectacular nature of its setting. Its ornamented architecture represents a masterpiece of the creative integration of European and native characteristics, crucial for the cultural expression of the entire region. 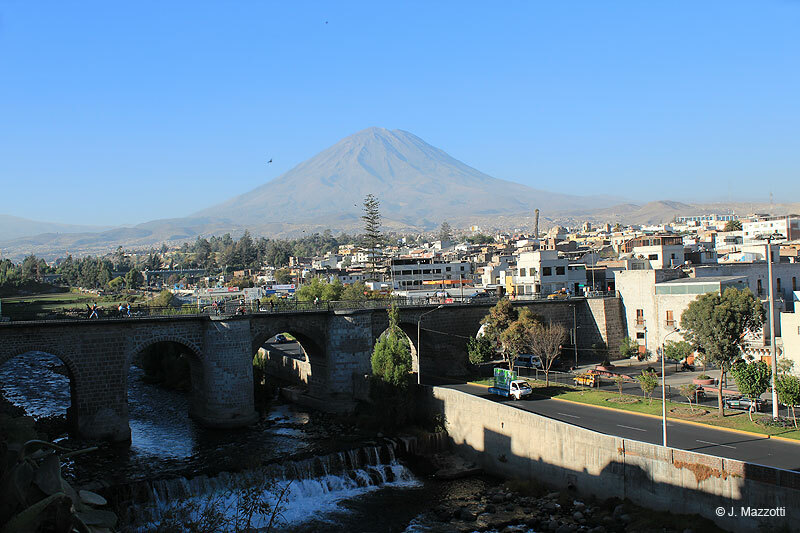 Arequipa was founded in 1540 by a handful of conquistadores. The site was in a valley that had been intensively farmed by pre-Hispanic communities, a fact that has contributed to the topography of the place. The layout of an indigenous hamlet has survived close to the Historic Centre in the district of San Lázaro. The World Heritage site consists of 49 original blocks of the Spanish layout (excluding three blocks adjacent to the Mercado San Camilo not considered to be adequate because of their style). In addition there are 24 blocks from the colonial period and the 19th century. 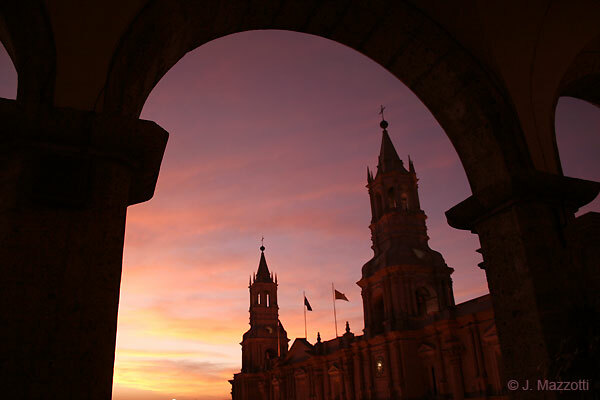 Major earthquakes have marked the key moments of change in the development of Arequipa architecture. It is thus possible to identify five periods of development: foundation as a village (1540-82), Baroque splendour (1582-1784), introduction of Rococo and neoclassicism (1784-1868), modern empiricism and neoclassical fashion (1868-1960), and contemporary design. The natural disaster of 1582 caused a major change in favour of antiseismic construction, introducing a systematic use of sillar, a pink or pearl-coloured volcanic stone that was freely available. Earlier this material had only been used in the doorways of the main church and in a handful of dwellings. Being soft, light, thermic and resistant, it now provided a solution to the problems caused by earth tremors, as well as being pleasing aesthetically. 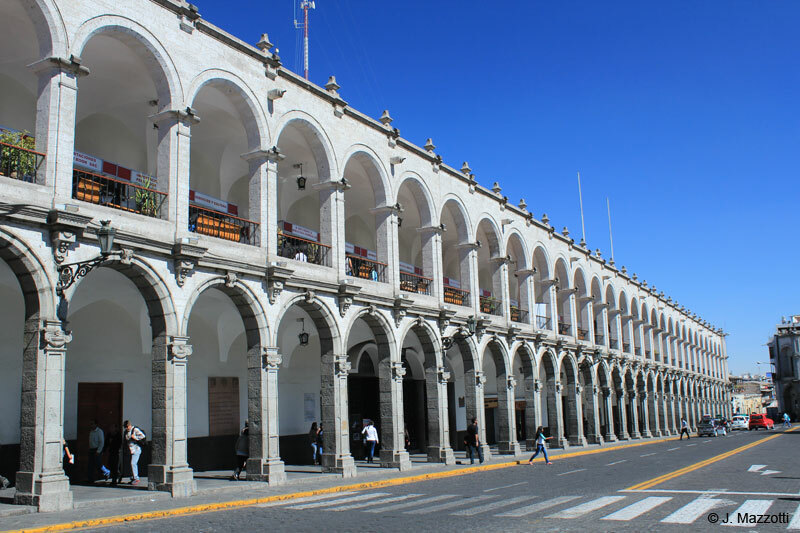 The core of the historic town is the Plaza de Armas (Plaza Mayor) with its archways, the municipality, and the cathedral, the most important neoclassical religious building in the country, constructed in the mid-19th century on the ruins of an earlier Baroque church. At one corner of the plaza there are the church and cloisters of La Compañia, the most representative ensemble of the Baroque mestizo period at the end of the 18th century. The chapels and convents of Santo Domingo date from the 16th to 18th centuries: San Agustín, La Merced and the church of Santa Maria; Santa Teresa and Santa Rosa; Puente Real (now Puente Bolognesi) and Puente Grau are also built from sillar. There are several alternative circuits that can be made walking when visiting all these marvelous places that are signaled in the streets. Some of these places need payed entrance. Inside the historical centre are located the main hotels, restaurants, bars and shopping area, also the commercial and bank area. One of the most beautiful plazas from Peru. In the center of this plaza is located a fountain with the statue "Tuturutú" on the top, which is an important symbol of Arequipa. Around it you can find important buildings with beautiful portals and colonnaded balconies, such as the City Hall, the Cathedral and an important church named Iglesia de La Compañía. One of the first 17th century monuments in the City. It was built of sillar, the most important neoclassical religious building in the Peru. It houses invaluable objects, like a church pulpit brought from Lille, France, and a 15-meter (49 feet) monumental Belgian organ. Located to one side of the Plaza de Armas. Visiting Hours : Monday - Saturday 10:00 am - 5:00 pm. Complex of buildings erected by the Jesuits for religious and residential purposes. The buildings constitute a monument that, according to many, exemplifies the most beautiful 17th-century (1660) religious architecture, the most representative ensemble of the Baroque mestizo period at the end of the 18th century. The temple dominates the center of the complex, inside the San Ignacio Chapel with polychrome cupola and religious jewelry. 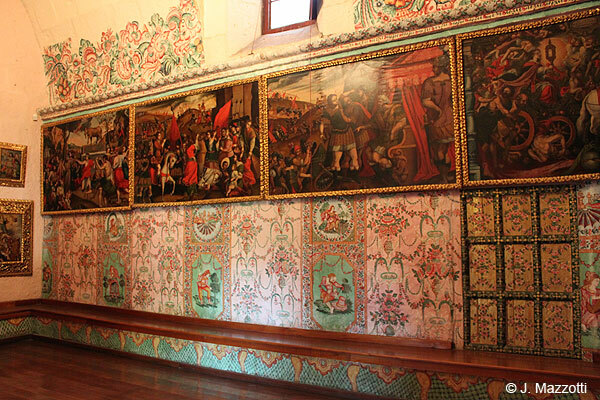 The interior of the temple houses more than sixty canvases by Cusco School artists such as Bernardo Bitti and Diego de la Puente. Location corner of Plaza de Armas. Visiting Hours : Church: Monday - Friday 9:10 am - 1:00 pm and 3:10 pm - 6:00 pm; Sat 11:30 am - 1:00 pm and 3:10 pm - 6:00 pm; Sun 9:10 am - 1:00 pm. Free admission. 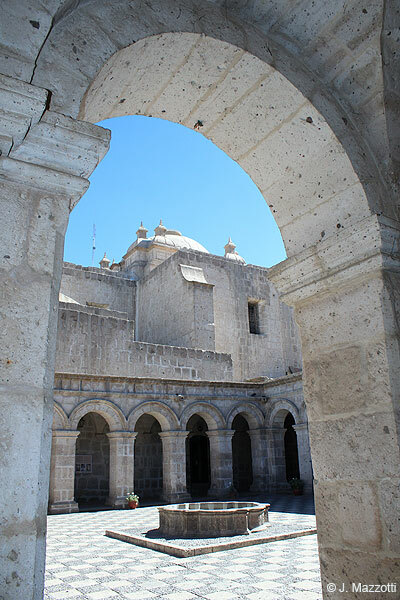 The Monastery of Santa Catalina was funded in 1580, is a spectacular religious citadel, integrating architectural styles from the 16th to 19th centuries and having an area of 20,000 m2. Eventually expanded to include cloisters, plazas, streets, tiled roofs, and cobblestone paving, this walled citadel served as total enclosure cloister for nuns from the city's most distinguished families. It is one of the most fascinating colonial religious building in Peru, open to the visitors after 4 centuries in 1970. 17th century Franciscan convent whose diverse architectural styles span from the Romantic to neo-Gothic, due to multiple reconstructions. It is characterized by a magnificent library of more than 20,000 volumes, some of which are more than four centuries old. Visitors may take advantage of recreational facilities, including a swimming pool, as well as lodgings with a 60 bed capacity. Location : Jr. Recoleta N° 117. Visiting Hours : Monday - Saturday 9:00 am - 12:00 pm and 3:00 pm to 5:00 pm. The complex encompasses the Franciscan church, the convent, minor temple known as Third Order and a plaza. Noteworthy within the church are the Baroque pulpit decorated in bas-relief and the silver frontispiece of the main altar. A short passageway named "El Manguillo de San Francisco" has also been integrated into the complex, which separated the church from what was once the first girls' school, and later, the women's prison. Currently, it has been converted into a marketplace for traditional handicrafts known as "Fundo El Fierro" (Iron Ranch). Location: Zela street, block 1. Visiting hours: Monday - Sunday 7:00 am - 10:00 am and 4:00 pm to 8:00 pm. Convent: Monday - Saturday 9:00 am - 12:30 pm and 3:00 pm to 5:30 pm. (1649) Church built in a beautifully carved stone, with a polygonal tower. It was almost totally destroyed by the earthquakes of 1958 and 1960 and then restored. Built with a bell tower, it consists of a vestibule with a corner pedestal and an impeccable arch beneath the choir. Visitors who venture inside may appreciate imagery and canvases with sacred motifs. 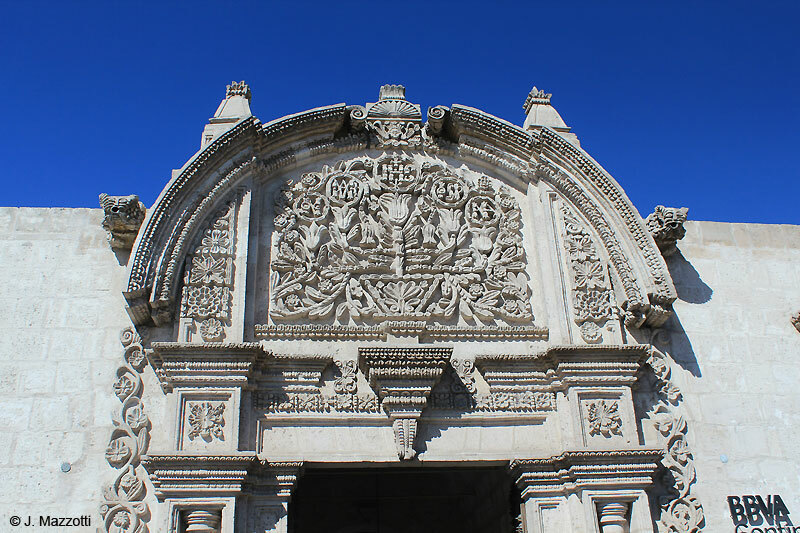 It is also remarkable for its side entrance —the oldest in Arequipa. The main cloister of the convent was built around 1734. Considered the oldest temple in Arequipa, the Cristo Crucificado (Crucified Christ) at the Main Altar is one of the most beautiful statutes in the temple, and is associated with a legend known as Quasimodo. The lateral doorway of the Iglesia de Santo Domingo, an allegory of the Last Judgement, is an example of such artistic expressions, typically found in all doorways of the city and the region. Location : Intersection of the Santo Domingo and Rivero streets. Visiting Hours : Monday - Friday 7:00 am - 10:30 am and 6:00 pm - 8:00 pm; Sat 7:00 am - 8:00 am and 6:00 pm - 8:00 pm; Sun 6:00 am - 1:00 pm. Free admission. Church built in 1575, it features a façade dating to the early 18th century and is considered one of the century's finest. Architecturally it belongs to the "Mestizo Baroque" style, with a preponderance of "sillar". Noteworthy features within the temple are the dome, the neoclassical altars, and most especially the main altar, notable for its fine stonework and gold-leaf embellishments. Hours: Monday - Friday 8:00 am - 1:00 pm and 4:00 pm - 8:00 pm; Sat 8:00 am - 1:00 pm and 3:00 pm - 9:00 pm; Sun 8:00 am - 2:00 pm and 5:00 pm - 7:00 pm. Free admission. Location: Intersection of San Agustín and Bolívar streets. Formerly the Monastery of Discalced Carmelites of San José built in 1710. After almost 300 years of foundation, it is opened to the public since 2001, and it leaves for the first time from this monumental architectonic set, to show the treasures kept throughout its three centuries of existence. It houses the most exquisite collections of paintings, sculptures, religious artefacts, and furnishings from the 16th to the 19th centuries. More than three hundred works of art they are displayed in its twelve gallery rooms. Some rooms show their original style since still they are in use on the part of the nun to certain hours of the day. Other rooms display a thematic organization. Before visiting the monastery a return by the Room of Interpretation puts in key for the understanding of the techniques and materials to us used in the art of the virreinal period. The collections are varied: colonial-era paintings, sculptures, murals, metalworks, gold and silver jewels of religious art, and objects of daily use, all of them corresponding ones to centuries XVI, XVII and XVIII. Located in Melgar N° 303. Daily visits from 9 am to 4:30 pm - fee admission. 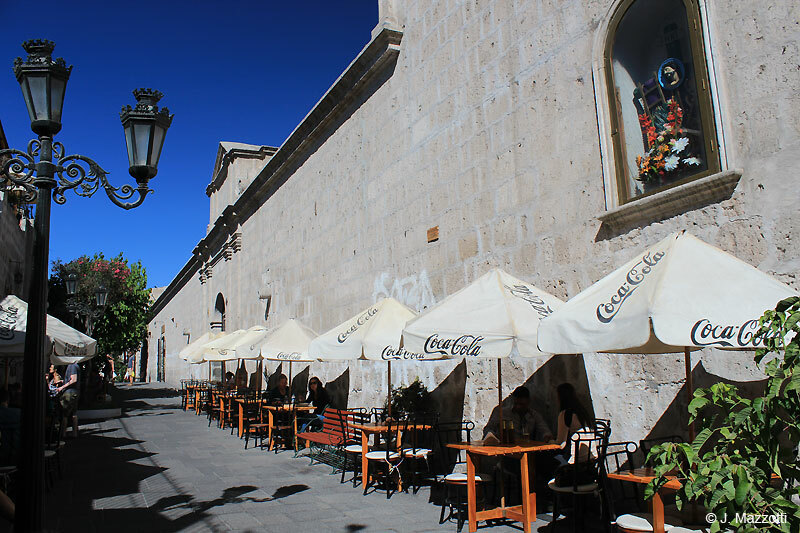 A picturesque neighborhood of alleyways, narrow passages, small plazas, and spacious houses, it is the oldest neighbourhood of Arequipa and is supposed to be the site where the city was founded. The Dominican priests were established there in 1538. Location: 5 blocks from the Plaza de Armas. Casa del Moral, one of the most beautiful and representatives of the city. A 18th century mansion, it is one of the oldest and most important architectural monuments from the Baroque era in Arequipa. The house owes its name to an old mulberry tree growing in its main patio. Decorated with colonial- and republican-era furniture. The gate built of "sillar" is itself a work of art featuring finely carved figures. Also noteworthy is a room with very old maps of America, dating from the 16th century. Hours: Monday - Saturday 9:00 am - 5:00 pm; Public holidays 9:00 am to 12:00 pm. location: Moral street N° 318. Casa Ricketts, (1738) old headquarters of the Seminar of San Jerónimo, also called Palacio Tristán del Pozo. Traditional mansion with a façade that features carvings in the "Mestizo Baroque" style, in addition to spacious and typical internal patios. It was built in 1738 for General Domingo Tristán del Pozo. It is currently the property of the Banco Continental, which has opened a valuable collection of Arequipan paintings to the public. In the Pedro Brescia Cafferata exhibition gallery, visitors may admire lovely watercolors and oil paintings by artists like Carlos Baca-Flor, Vinatea Reynoso, Núñez Ureta, and Palao Berastain. Hours: Monday - Friday 9:00 am - 6:00 pm; Sun and 9:00 am to 1:00 pm. Location: San Francisco street N° 108. It features goods donated by Arequipan families who had zealously guarded the relics of their ancestors. It was established on 18th August, 1955, in the upper floors of the Municipal Library. Later, on 15th August, 1977, it was moved to its present location. The property was donated by the Presbyterian Jorge Antonio del Fierro Velarde. Location: Plaza San Francisco N° 407. Hours: Monday - Saturday 9:00 am - 5:00 pm. It displays about 1,000 objects (ceramics, textiles, funerary bundles, as well as stone, metal and wood works) from the different cultural groups that developed in the region since 12,000 B.C. to the civilizations of the Nazca, Tiahuanaco, Wari, Churajón, Acarí, Aruni and Inca, in addition to transitional and colonial items. Location: Cruz Verde street N° 303. Hours: Monday - Friday 8:30 am - 4:00 pm. Free admission. Pre-Hispanic textiles, mummies, and stone and metal objects are exhibited inside. It houses valuable ceremonial "keros" and cups in its Yabar Collection. Location: Intersection of Álvarez Thomas and Palacio Viejo streets. Hours: Monday - Friday 8:30 am - 4:00 pm.